Sakura Majesticware by designer Sue Zipkin. Orchard valley pattern with sponge edge and hand painted fruits design. 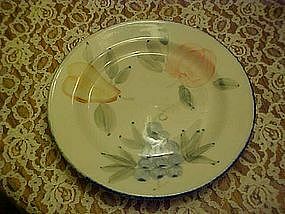 Salad plate measures 7 3/4" in diameter. Dishwasher and microwave proof genuine stoneware. I have 12 of these available, and all are in perfect condition. Price is for each. I have other pieces listed in this pattern.